As mentioned in my earlier post the winter can get quite cold in Finland. We have recently experienced temperatures of -25°c only last Saturday. 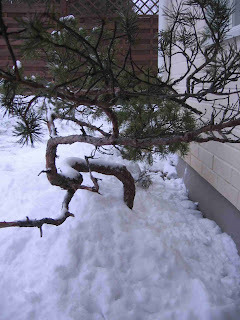 My bonsai (potensai) collection at the moment is quite small so I am able to offer more protection for the deciduous trees by placing them in my garage and on the heater bed I made, but the two pine trees I have left outside. The pines, as with all evergreen species, require some light during the winter period as photosynthesis still takes place. I moved the pines closer to the house to get some protection from any strong winds, we could get during the winter, and to remove them from the direct sunlight that we can easily get on a nice winter's day. Exposure to direct sunlight during periods of sub-zero temperatures can cause damage. 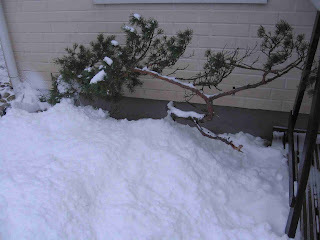 When the first heavy snow fell I covered the boxes that the trees are planted in with the snow. This helps to keep the temperature under the snow a little higher than the actual outside temperature and protect the trees from any heavy frost. Now we wait patiently for spring to see if all of these various techniques for protecting the trees during the winter period have paid off.